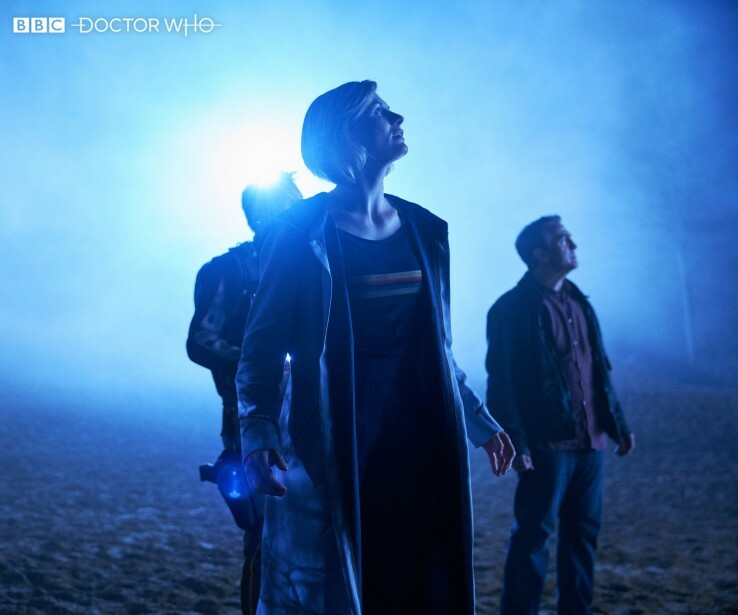 Whether it’s the fresh-faced companions or the fact that Jodie Whittaker is about to make history as the first female Time Lord (and not a moment too soon), it’s becoming increasingly clear that the BBC and series showrunner Chris Chibnall are aiming for a totally new interpretation of the Doctor Who we know and love. So when Internet scuttlebutt indicates that John Barrowman may be returning as Captain Jack Harkness, it’s best to treat those rumors with heightened caution. And sure enough, reports of Barrowman holding a secret role in Doctor Who season 11 have been greatly exaggerated – to the point where current star Shaun Dooley had to come out and debunk them via Twitter. This all began when the BBC dropped a cryptic nighttime shot of Jodie Whittaker’s Doctor in action alongside Graham (Bradley Walsh). The duo just so happened to be joined by a third party who’s face is masked by the blinding (alien?) light from the background, though the character’s general frame and hairstyle sparked rumors of John Barrowman reprising the role of Captain Jack. It’s certainly a vague tease of season 11, and sure enough, it wasn’t long before the Internet began filling in the blanks with their own weird and wonderful conspiracies involving a certain Captain Jack. Alas, that couldn’t be further from the truth, as the figure in the backdrop is none other than Shaun Dooley. Circling back to Jodie Whittaker, though, and a recent interview with Doctor Who Magazine (h/t Radio Times) reveals that she’s still wrapping her tongue around some of the show’s jargon. I mean, out of all the things I’ve had to say, like ‘artron energy’ or ‘vortex manipulator’…all that kind of stuff is brand new to me. But I really practice the words that I’m not used to. Said to include 10 standalone adventures featuring Jodie Whittaker’s enthused Time Lord, Doctor Who season 11 begins its rollout on October 7th – day and date with The Walking Dead‘s historic ninth season.